There’s a certain level of mythologizing that happens in sports stories. We tend to view athletes as heroes and villains, and try to impose a moral narrative to basic contests of strength and skill. You see it happen in live commentating, interviews, and 30 for 30 documentaries, but biopic films are on another level. 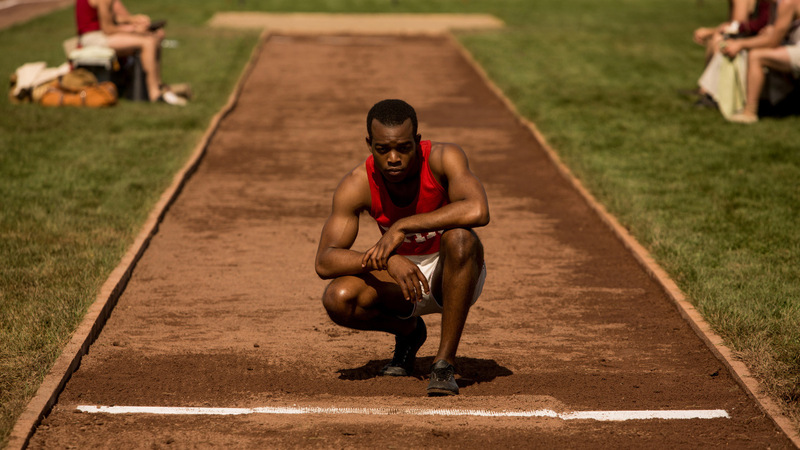 And if you want the Platonic ideal of a larger-than-life sports biopic, Race, directed by Stephen Hopkins and starring Stephan James, is a pretty good choice. In terms of heroes and villains, Race mines some subject matter that’s already primed for it. 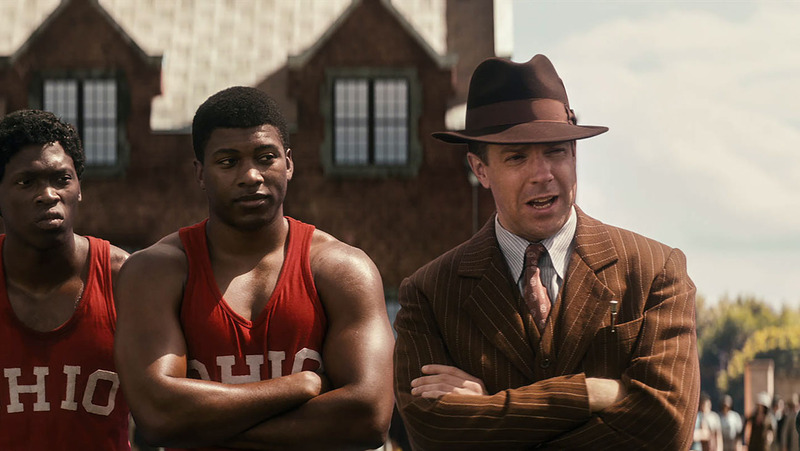 It follows the life of Jesse Owens (James), from his beginnings as a track and field star at Ohio State through [SPOILERS for historical events from eighty years ago] his gold-medal victories at the 1936 Olympics in Nazi-controlled Berlin. By his side is coach Larry Snyder (Jason Sudeikis), a fiery, troubled but good-hearted champion of Owens. The film also weaves together stories of Avery Brundage (Jeremy Irons) attempting to reach a compromise between the Third Reich and the American Olympics Committee, and Leni Riefenstahl (Carice Van Houten) documenting the Games as fairly and accurately as possible, despite the meddling of Joseph Goebbels (a sinister Barnaby Metschurat). There’s a lot going on, but Hopkins ties it together well, primarily by focusing on the two main performances: James as a subtle, nuanced Owens, and Sudeikis as a broad, passionate Snyder. James’s Owens is often quiet and introspective, conveying his thoughts to the audience more through facial expression and body language than long speeches. Sudeikis plays Snyder as a foil; he’s witty, loud, often rude or obscene, and he never hides his excitement or dissatisfaction. Watching the two of them bounce off each other makes for the best scenes of the movie, from light moments like a joking conversation on the way home from a successful meet to powerful interactions like an altercation at Snyder’s office over the pressures Owens faces on deciding whether to even attend the Olympics. It’s a strong core to the film, and the vein of funny-but-not-overtly-comedic roles that Sudeikis should probably mine more going forward. Race also mixes gorgeous period details with some clever modernistic cinematography and editing tricks. The costuming and set design is pitch perfect, a sepia-tinted world that still feels appropriately lived-in. One of the best design elements of the film stems from a scene in which Snyder loudly lectures his integrated team over the jeers of the whites-only football players. All the sounds besides Sudeikis’s voice gradually drop out and from then on, as an aural signifier of Owens’s level of focus during a meet. 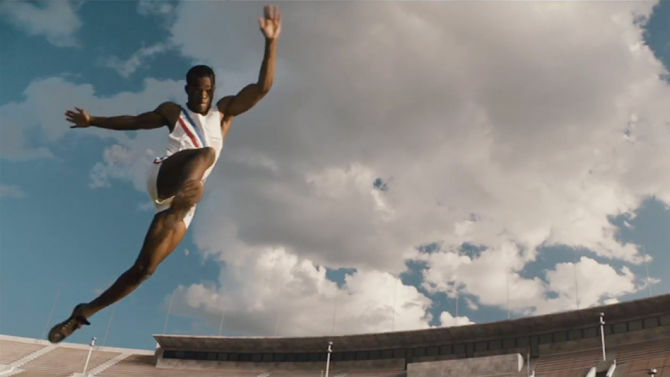 The film also plays with how it conveys various track events, as there are only so many ways to shoot a ten-second sprint. Owens’s third gold medal win isn’t even shown on camera, but rather relayed through the radio to his proud family and friends onscreen. It keeps things interesting even as it moves toward an inevitable, telegraphed ending. That’s the one criticism I could see someone having, that Race is pretty by-the-numbers and more than a bit exaggerated. It’s about as on-the-nose as you’d expect a film called Race about Jesse Owens to be. Larry Snyder is a developed, interesting character, but more often than not he’s a White Man Hopping Mad about Injustice. When Owens returns from a bout of infidelity to apologize to his fiancée, he’s soaking wet from the rain and literally holding his hat in hand. The first introduction to Nazi Germany is through a flyover shot with a rumbling, ominous score so cartoonish that I laughed out loud in the theater. The film discards any complications or shades of gray in its depiction of Brundage and Riefenstahl in favor of good, idealistic people trapped in the web of the spidery Goebbels. That’s the primary theme of Race: taking the spirit of the events that happened and building on it, until the “moral” of the events, that freedom, equality and fair play are key, is reflected in pretty much every scene. It’s not a historical documentary, but it’s more interested in imparting that truth. That makes it a little storybook-like, but there are far worse things it could be, and as inspirational biopics go, it’s top tier. ← Previous Previous post: Deadshirt is Reading: Faith and The Coming of the Supermen!